The next Setanta Leinster League Orienteering event will be on Sunday 28th April in Oakwood. The usual 7 courses are on offer. 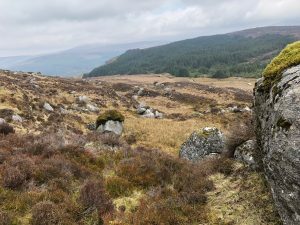 The terrain is mixed, semi-open and rough open, runable and slow forest, and open mountain side where there are many boulders and interesting contour detail. There has been some recent felling and the map has been updated to reflect this. Only the technical, longer courses will have controls on the open mountain. For all courses, the underfoot conditions in the forest will probably be quite wet, with some debris from felled trees. SI Rental is EUR 2.00 for those who don’t already have one. Parking Enter the forest road at O 036 022 and parking is about 2-3km in on the forest road. Directions From Hollywood take the R755 towards the Wicklow Gap, the forest entrance is about 100m past Ballinagee Bridge. From Laragh, take the R755 towards Hollywood, the forest entrance is 5km after the Wicklow Gap, just before Ballinagee Bridge. We are all doing our bit for the environment and Setanta Orienteers encourage you to remember to bring your own reusable cup to the refreshment tent after the event. Click here for full event listing. Setanta Orienteering club are proud to host the 22nd Rogaine Ireland event this June in the Wicklow Mountains. Please familiarise yourself about rules and kit requirements for both the 6 and 24hr events. This event is a great chance to get right off the beaten track in some of the most beautiful parts of Wicklow. The event will challenge your teamwork, endurance and strategy all at once. A fair few folk use the event to train and practice their navigation for long distance team AR events and it is the obvious next step up from the popular Nav Challenge IMRA Series. If orienteering events aren’t long enough for you, this is your event. The Rogaine is a score event with the challenge to pick up as many points/controls as possible in the given time, with route choice left up to each competitor. Grid reference control descriptions are given out at the start of the event and you plot and plan your course in race time. The 24 hour is a tough enough event if you go at it hard and try to keep going for the duration especially if the weather is challenging, but once you have a decent level of navigational ability, it is well recommended. Some bring tent/ bivy and camp out, some come back to base at night where you can camp and get food and others just keep going. If unsure of your navigational abilities especially at night then please do not enter the 24 hour event. GPS’s or other such navigational aids, food drops, organised outside support, etc are not permitted. Leinster League No. 6. Oakwood, 28th April 2019.